LONDON AND NORTH EASTERN RAILWAY AND CONSTITUENTS. 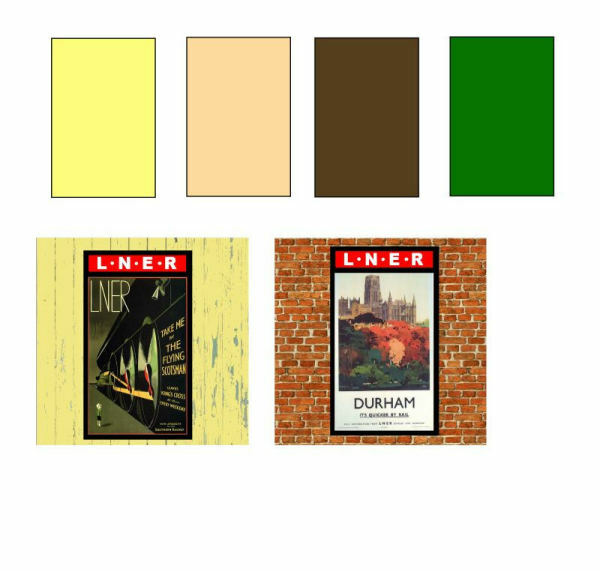 When the LNER was formed in 1923, it introduced a colour scheme for buildings of two light colours, stone & deep cream, either of which was used with a brown called 'dark brown', though in fact it was not a partcularly dark shade. This remained in use until July 1937, and there is a clear colour photo of the livery on page 81 of 'Big Four in Colour'. The colour scheme was not far removed from that already in use on the GER and the GNR. 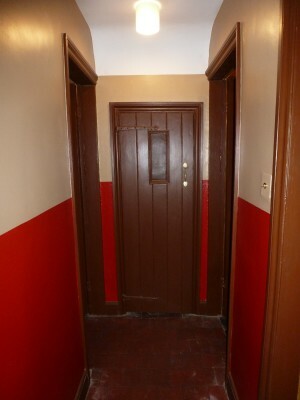 A painting specification dated 1924 mentions a thin black line separating the brown & cream on timber buildings where the bottom 4' 6" of the walls was painted brown. Internally the brown was used up to dado level, above which stone paint or terra cotta or green distemper could be used on the walls. 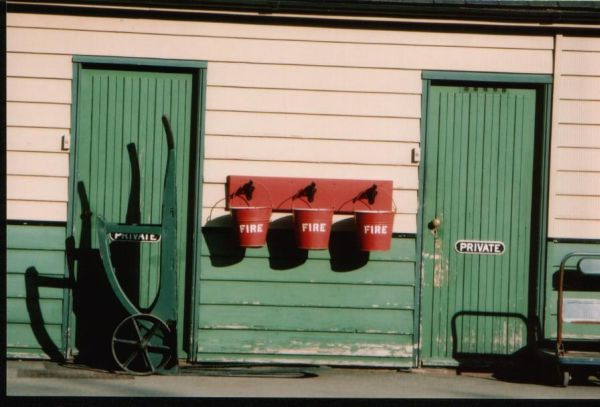 Station signs were black with white lettering. Interestingly, the specification refers to dark & light browns, so there may have been two shades in use but no other information on this is available to me. Poster boards were black other than a red heading plate with the company name in white, continuing the GNR colour scheme. 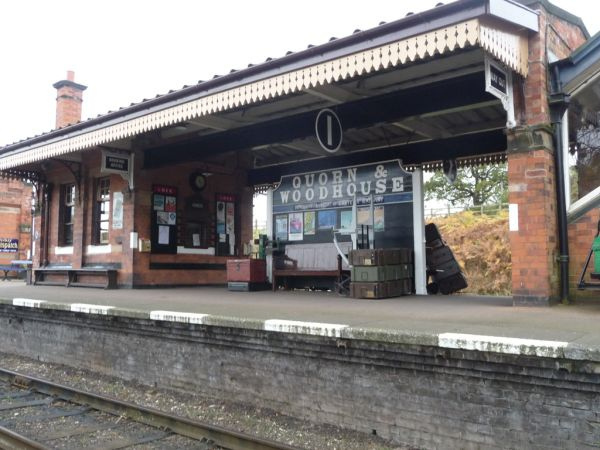 Quorn station on the GCR has just been restored to this livery and looks superb. Footbridges were painted in the brown, as were metal handrails and the like. Fencing & gates were stone or cream. In July 1937 a new schedule was introduced in which the brown was replaced with a mid green ('Buckingham Green') which brightened things up considerably. The deep cream and stone were used on large areas of planking, canopies, etc. and the green was used in place of the brown on doors, metalwork, framing etc. with a slightly lighter shade of the green used for door panels and other small details. A much lighter green called 'Sea Green' was used for canopy brackets & ironwork above the capitals of the columns. Poster boards continued to be painted as before. 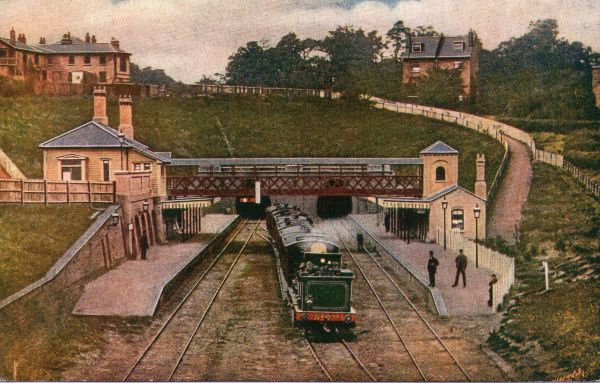 Timber footbridges were painted stone or cream, but metal footbridges were painted green, as were water tanks and water columns. A 1936 copy of the Railway Magazine mentions the first experimental application of this livery; it was proposed to repaint 354 passenger stations and depots together with adjoining signal boxes and offices. Among those treated were Leicester, Chesterfield, Colchester, Ely, Frinton, Felixtowe, Lowestoft, Dinsdale, Eaglescliffe, Thornaby & Hornsea Bridge, presumably all stations in need of a repaint at the time. Some branch lines were to be given special paint schemes, though no details of what these were are given; Newcastle to Carlisle (hardly a branch! ), Alston, York to Harrogate & Scarborough to Whitby are mentioned together with the Riverside branch on Tyneside. Lineside cast iron notices seem to have been red with white lettering for 'Beware of Trains' and 'No Trespassing' and white on blue for others, though white on black and black on white have also been noted; it may have varied with the area of the LNER, or have been pregroup signs that had not been repainted. As far as I know colours did not change in 1936. 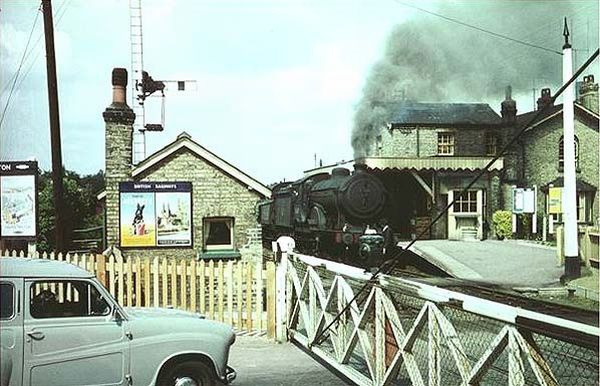 Colour photo's showing the green livery in the 1950's are very common; most stations carried it until they closed. The green faded rather with age; see the comments in the BR (E) section below regarding the possible reason for this livery lasting so long. PAINTS FOR MODELLERS: Deep cream - Precision SR buildings cream. Stone - Humbrol enamel no. 71 Green- Precision SR Middle Chrome Green for when new, if faded Tamiya flat green mixed with a touch of white. Brown - Precision LMS buildings brown or Tamiya flat brown. Sea green - Precision LNER loco green. BEST PLACE TO SEE IT; Pickering station for the green & cream, Quorn station for the brown & cream. Thanks to David Chappell & Bill King of the GERS, and to Andy MacIntyre and Mike Bootman for helping with information. Thanks also to Jonathan Clark for telling me about Tynemouth station. Most people picture LNER stations in green and cream, but until 1937 this was the station livery although you rarely see it modelled. 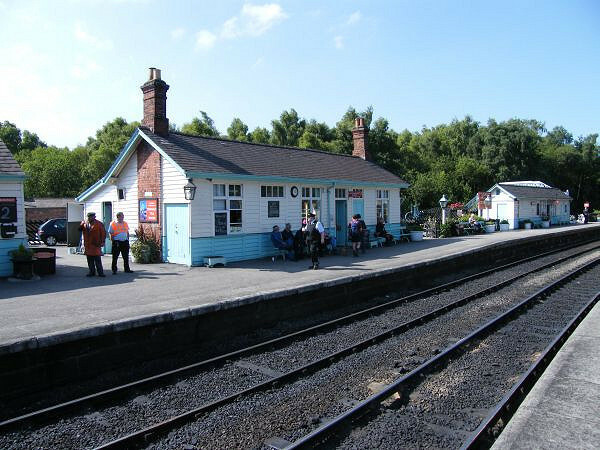 Pickering station has been beautifully restored to the later livery. On the left is some genuine LNER green paint, but very faded over fifty years since it was applied. 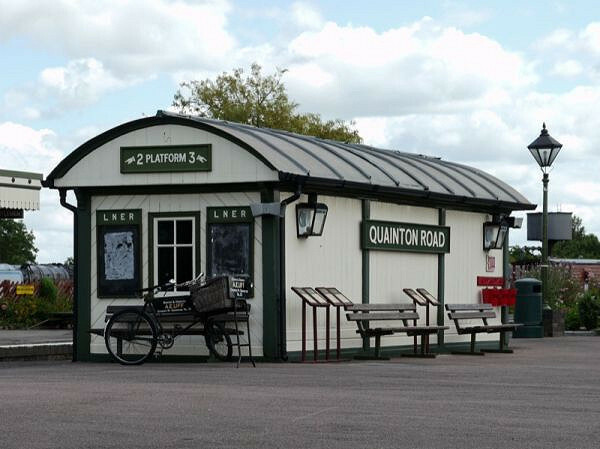 The poster boards are incorrectly painted at Quainton Road in the picture below. The NER used an attractive livery of creamy buff and a bright reddish brown, using more of the brown than was usual on other lines and also using the buff on window frames & glazing bars. Almost the same colours were used on station signs & notices, except that a cream was used in place of the buff. In practice this was almost the same colour, though there was some variation. Poster boards could be painted in the brown & lettered in cream, or painted cream & lettered in brown - both have been recorded. PAINTS FOR MODELLERS: Buff - Precision SR buildings cream. Brown - Tamiya red brown. 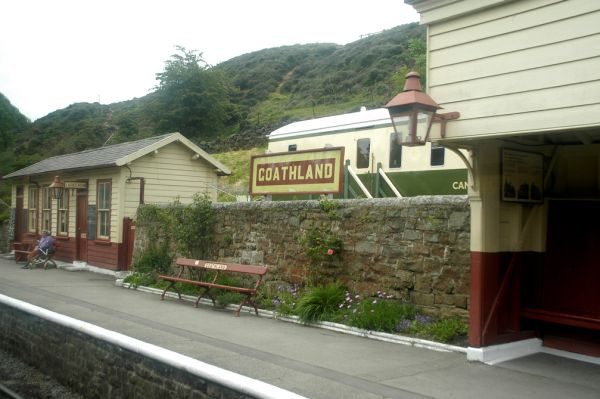 BEST PLACE TO SEE IT; Goathland station, North Yorkshire Moors Railway; Beamish museum. On the right is an NER tablet machine support cabinet still with NER red brown paintwork in situ. Thanks to Michael Dunn & Alan Sibley for help with this section. This information is taken from official GNR painting specifications issued in March 1899 & March 1915, so it is accurate and comprehensive.....for the full documents, see the 'GNR SCHEDULE' page. The main two colours used were 'Light Stone' and 'Dark Stone', the former a light buff colour & the latter a darker buff. There is also reference to 'Light Brown' & 'Dark Brown' which were not the same as the stone colours. 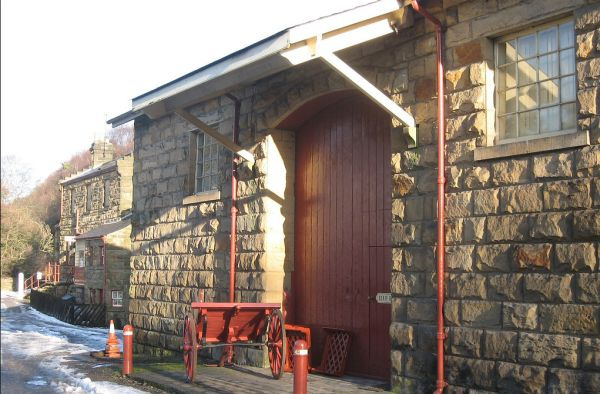 The light stone was used on planking, panels, canopies etc, and the dark stone on station ironwork, wooden framing etc. Canopy support pillars were dark brown for the bottom 5 feet, light brown above with a one and a half inch wide black band between the two. Canopy girders were painted Light Brown. Valencing on station canopies was often picked out in stripes of two colours, probably light & dark stone. In 1899 and presumably up to 1914, window sashes were painted light green, as were skylights. For the fully detailed painting schedule see the 'SPECIFICATIONS' page. Doors were described as 'combed light oak', with door & window frames 'combed dark oak', presumably a varnish rather than a paint. However, 'dark oak' could have been a darker brown paint, as it was also used for seats, on which the ironwork was painted black.....in practice 'dark brown' and 'dark oak' would have been very similar. Lettering on seats was white. 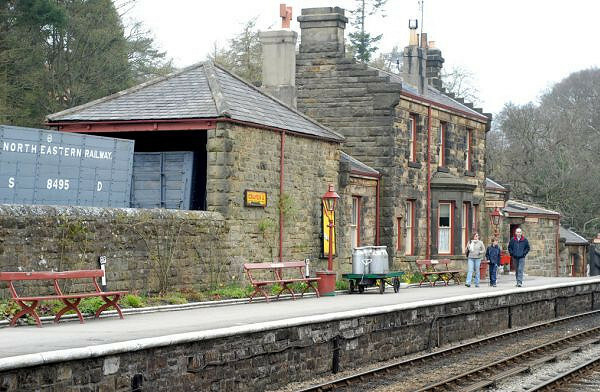 Station signs & name boards were black with white lettering....... poster boards are described as 'headings & ground, red, letters in white with the remainder black', the remainder presumably being the beading. In 1899 notices had the outer beading picked out in red, with the inner beading in white. 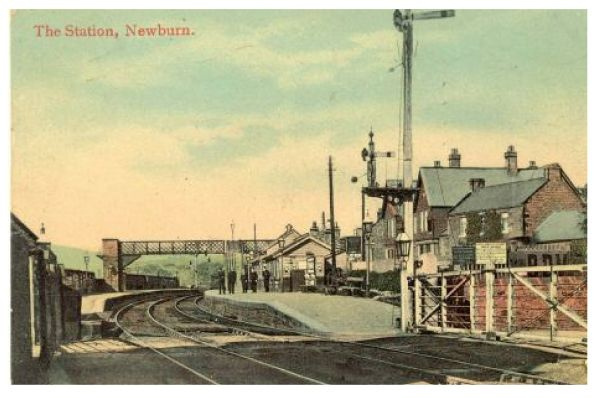 Station fencing was white if wooden paling, or dark brown if metal, all gates being dark brown. Inside buildings, the ceiling was white distemper & the walls were light green distemper, but there is a note saying that discretion was allowed with regard to interiors, especially if the room was likely to be dark.Corrugated iron roofs were to be painted 'dark brown' , and 'light stone' on the inside. 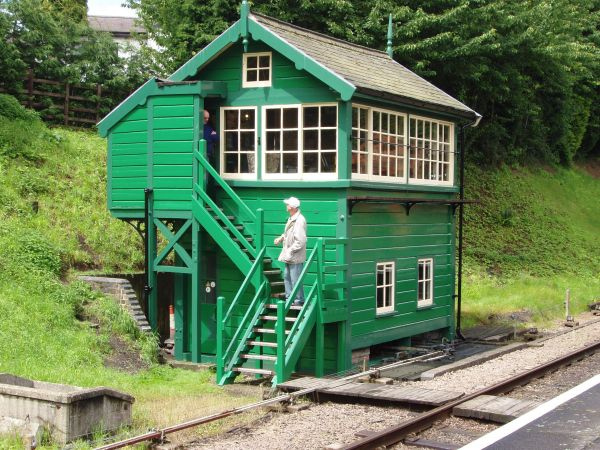 Signal boxes when all timber were painted dark brown up to 4' from the ground, then a black band one and a half inches thick, with light & dark stone above. Inside they were dark brown up to dado level & stone above. Steps were light & dark stone, and the nameboard was white on black. 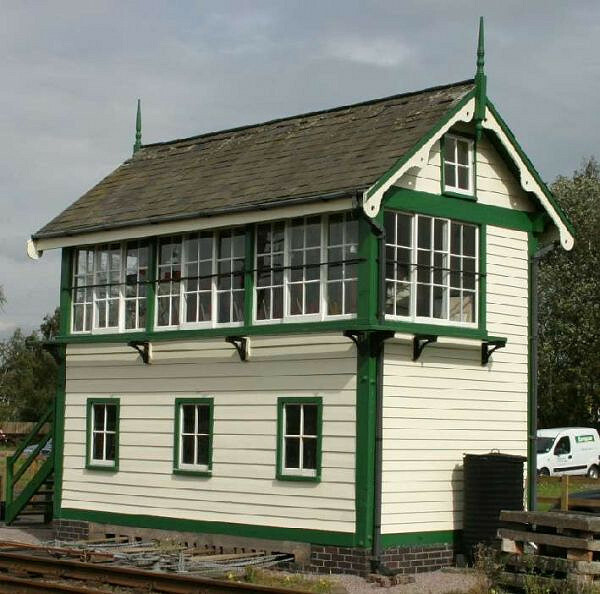 Signal box windows were finished 'as for stations', which means in 'light oak' which in practice would have been very similar to light stone, but may indicate a varnish rather than a paint. Cranes were dark brown with black ironwork; water cranes were painted in the same way as canopy support columns. Iron or steel bridges were painted 'light brown picked out in dark brown', this including footbridges. Water tanks were light brown picked out in dark brown. PAINTS FOR THE MODELLER: Light Stone- Precision LMS buildings cream Dark Stone - Precision SR Dark Stone. Light Brown - Precision GWR Dark Stone Dark Brown - Precision LMS Buildings brown. Many thanks to Michael Dunn of Kidderminster Railway Museum & Allan Sibley of the GNR Society for passing on to me copies of these specifications. The two interior pictures below show a GNR house at Kimberley station restored to GNR colours by matching paint samples taken from the woodwork. The colours correspond to the official GNR painting specification, including the surprisingly bright green. My thanks to Peter Saunders for sending me the pictures. The GER used a very pale stone colour for the bulk of the woodwork, with a reddish mid brown, (Brown Oxide), for ironwork etc. and some smaller items picked out in black. Unusually doors seem to have been painted in the lighter colour, as were window frames. 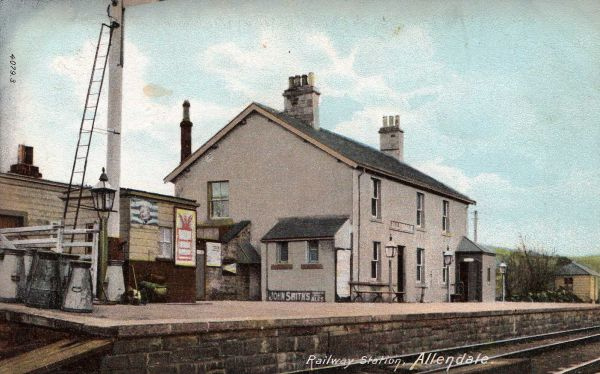 It seems that the District Engineer had considerable leeway when deciding on painting schemes; there are references to signal boxes being painted brown all over, though happily this should be obvious from a black & white photograph, as should the colours of station doors. 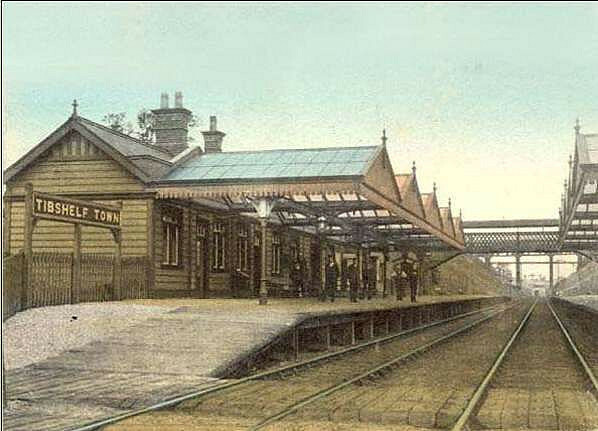 There is a reference to the painting of Hertford station in 1886 when Dark Sage Green was used on metalwork & the woodwork was Varnished Oak, exterior & interior alike. Poster boards were black with a blue top panel, probably enamelled metal, lettered 'GER' in white. Station nameboards had a blue background with white lettering, as did station signs. Photographs suggest that a lot of GER station poster boards did not have any company identification at the top of the board. PAINTS FOR THE MODELLER: Buff/stone - Humbrol enamel no. 71. Brown - Tamiya red-brown.. Thanks to Bill King of the GERS for helping with this information. 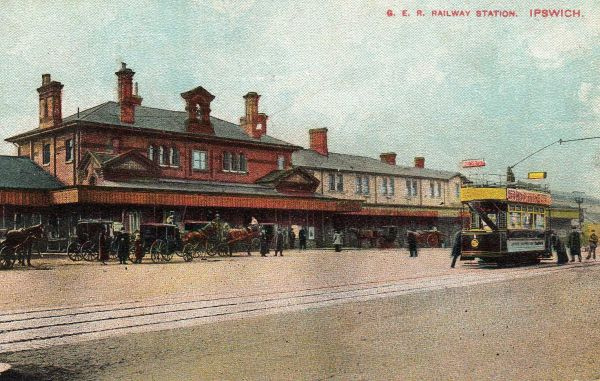 The GCR began life looking rather dull, but ended it as one of the brightest lines in the country. 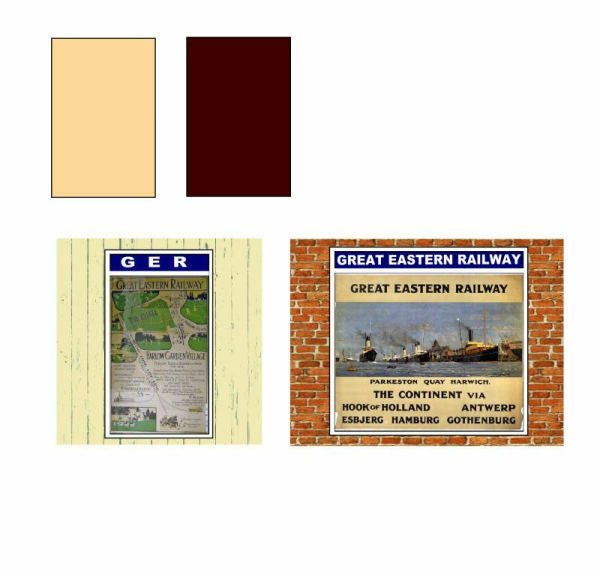 The original livery for buildings was inherited from the Manchester Sheffield & Lincolnshire, and used cream for the bulk of the woodwork with the framing etc in a light brown similar to GWR dark stone. 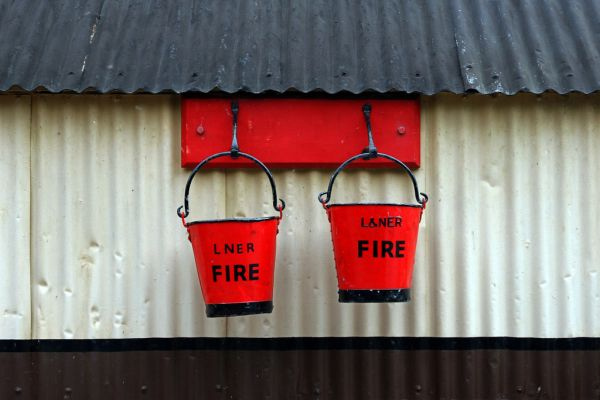 A much darker reddish brown was used on the lower part of the walls of signal boxes & possibly other buildings, maybe as a preservative. In 1912, however, a new colour scheme was introduced. This used two shades of green, the lighter one replacing the buff and the darker both the browns of the old scheme. Window frames were painted white. The underside of a station canopy was painted light cream, including the ironwork & the inner face of the valencing, no doubt to make the platform lighter. 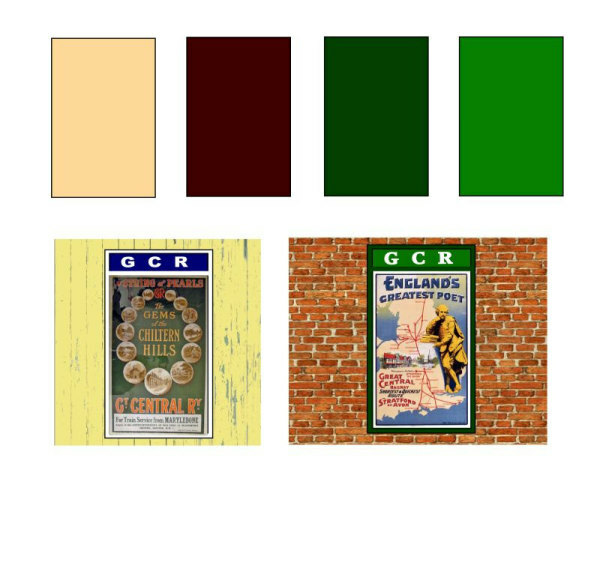 Poster boards before 1912 were painted black with a blue top panel lettered in white, but with the green livery the boards were painted green, and lettered ' G.C.R.' in an unusual serif script. Station signs became white on a green background. Pre 1912. Cream Precision SR buildings cream Brown - Precision GWR dark stone. Dark brown - Tamiya Hull Red. Post 1912. Lighter green -Precision SR Middle Chrome Green. Darker green - Tamiya XF-70 dark green. 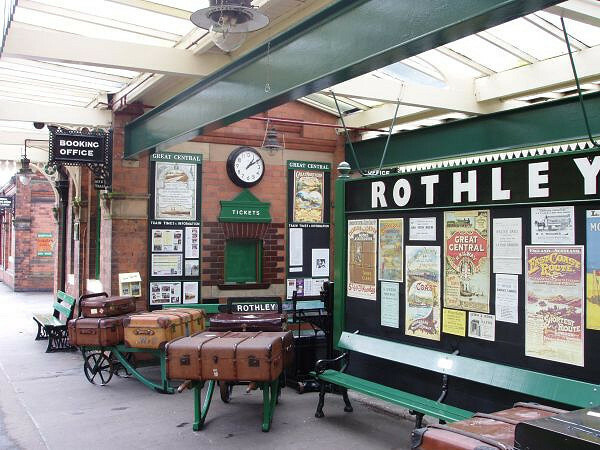 BEST PLACE TO SEE IT; Rothley station, Great Central Railway - no surprise there! 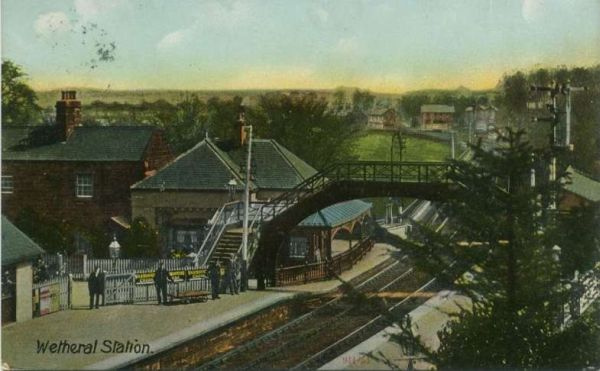 There is a colour photograph in Railway Archive 24 showing Waddeston Manor station in 1910. This shows the woodwork to be painted buff & a lightish brown, and the poster board to be black with the company name on the heading panel in white on blue, probably an enamelled plate. 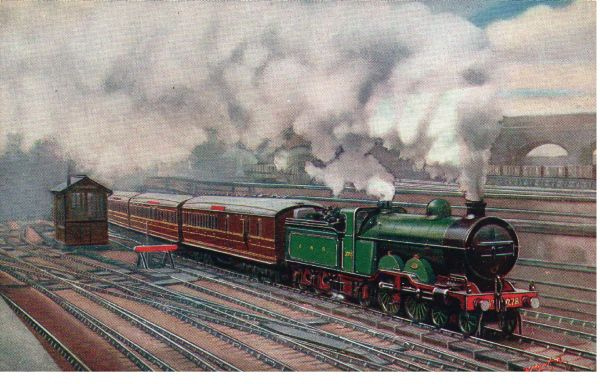 By the 1930's Metropolitan stations were painted in an attractive light green and cream as shown in the painting below which is set in 1932. 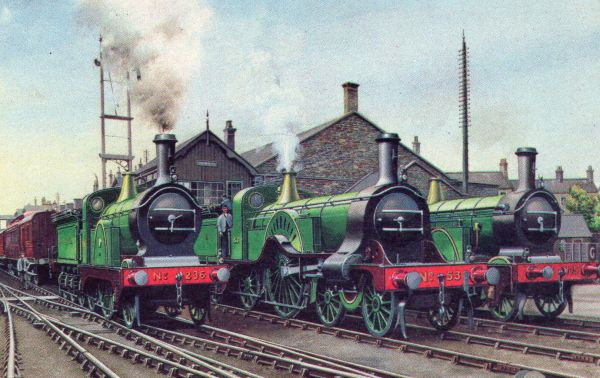 The green is lighter and has more yellow than the LNER shade. Poster boards, station signs and running in boards were painted 'Derby Red' which wasn't a crimson lake but more of a scarlet shade, with black beading around the edges. Lettering in all cases was white, and it was shaded in black where the lettering was painted rather than cast iron letters screwed in place. 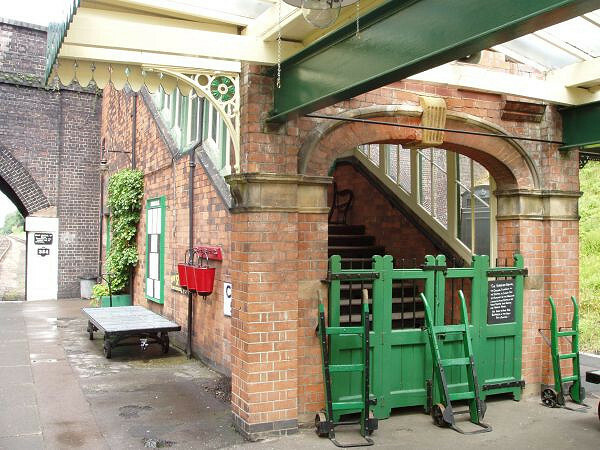 Station seats were painted green, as were metal footbridges. Station trolleys were red. Lamps on stations were painted black. Many Met. stations had diagonal fencing similar to that used on the Midland, and this was creosoted, never painted. Small poster boards were lettered 'METROPOLITAN' while larger ones had the full 'METROPOLITAN RAILWAY'. PAINTS FOR MODELLERS: Cream -Precision SR buildings cream. Green - Precision LNER locomotive apple green. 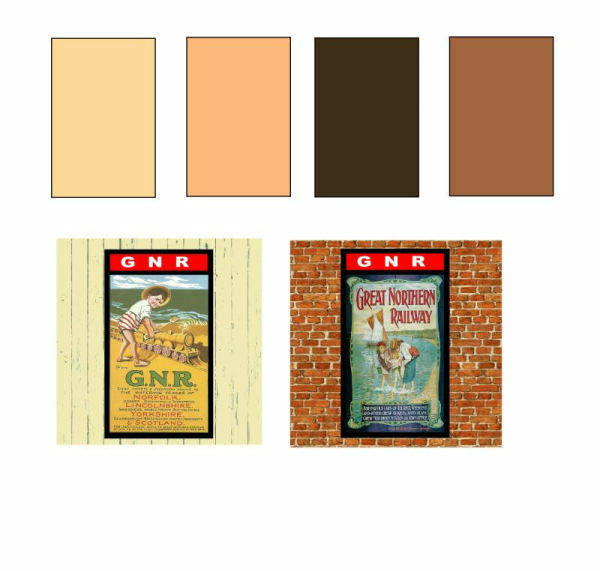 The M&GN did not copy either the MR or the GNR, but devised its own colour scheme for buildings, using a pinkish cream similar called confusingly 'stone' with a very light yellowish brown colour called 'tan' by the railway. Window frames were white. 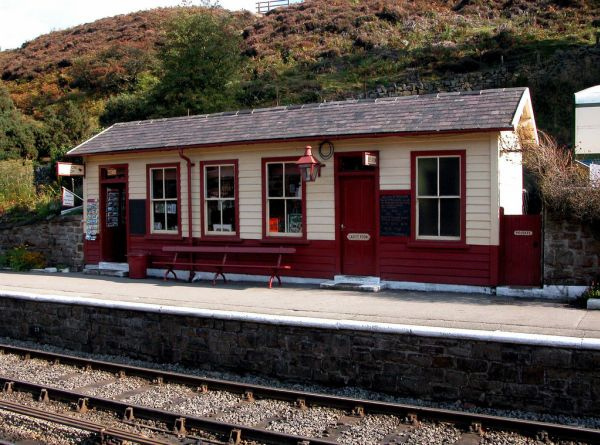 Some stations used a darker brown based on iron oxide in place of the tan, similar to the M&GN wagon colour, and the use of this should show in a B&W photograph....use of the darker brown gradually died out and the tan became the standard darker colour. From around 1914 the tan was a slightly darker shade than that used hitherto. Door panels, finials & the boarding on wooden buildings was usually cream, with the remainder of the woodwork in the darker colour. 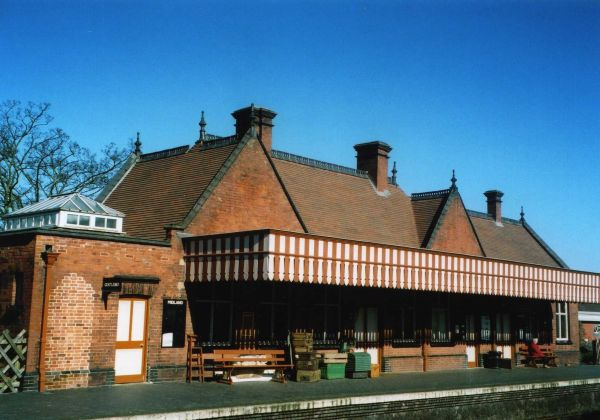 Valences could use alternate colours as shown at Weybourne. The repainting period for buildings was ten years. 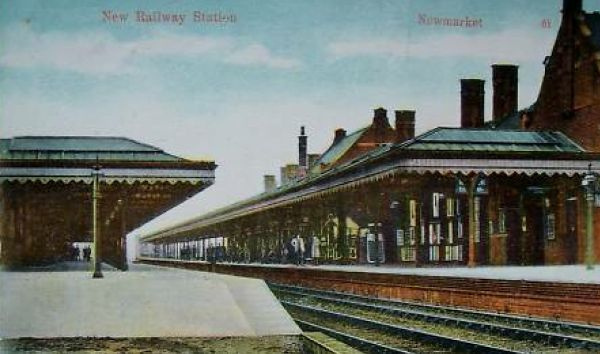 After 1923, M&GN stations when repainted followed the LNER colour scheme. Poster boards on the M&GN were black, lettered in white. Station nameboards were also white on black. PAINTS FOR MODELLERS: Cream - Humbrol enamel no. 71. Brown - Precision GWR dark stone. 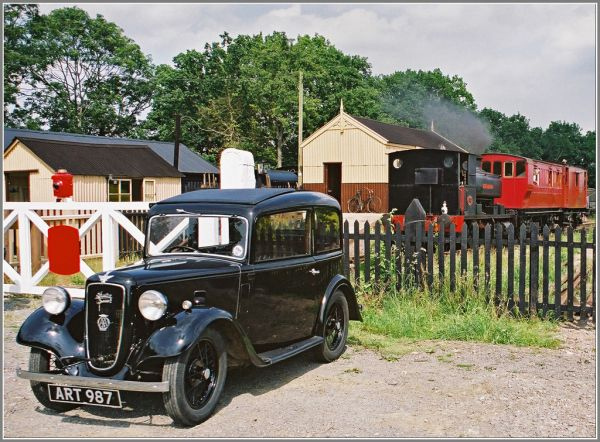 BEST PLACE TO SEE IT; Weybourne station, North Norfolk railway. Information from the M&GNR Circle courtesy of Roger Kingstone. In independent days the MSLR painted buildings in cream and a mid brown, although the restored examples below are in LNER colours which was very similar. The H&BR painted the woodwork on buildings in a cream & brown colour scheme, and the doors & metalwork were also painted brown. Buildings interiors were brown up to dado level, and cream above with brown doors. Station fencing was painted cream. Station nameboards were brown with the raised lettering in cream or white. PAINTS FOR MODELLERS; Cream - Precision SR buildings cream. Brown - Precision LMS buildings brown. FURTHER INFORMATION: North Eastern Record, HMRS. 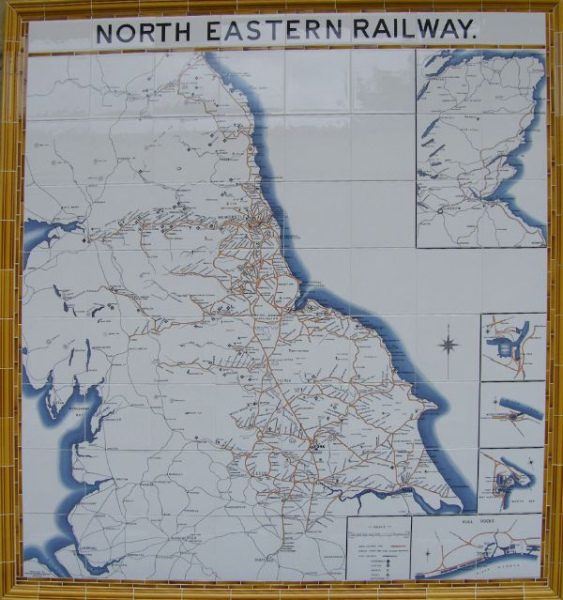 The former LNER area was divided into the Eastern & North Eastern regions. The official regional colours were Oxford blue & tangerine. 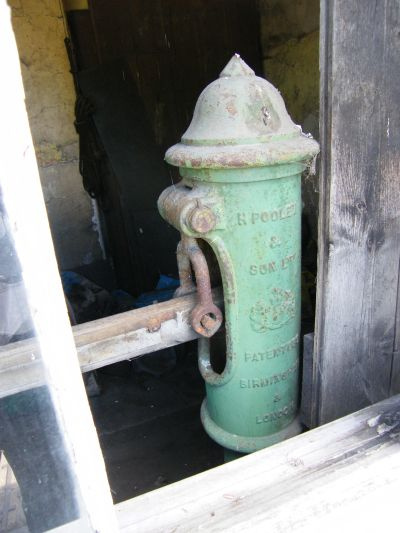 On the Eastern Region, the blue was used for signs, poster boards, etc, but does not seem to have been used at all with the standard cream for the buildings themselves. Most still carried LNER livery when they closed. I don't know what the official policy was, and why unlike the W, S & LMR regions every building wasn't quickly repainted in the new scheme, but the following sounds possible. 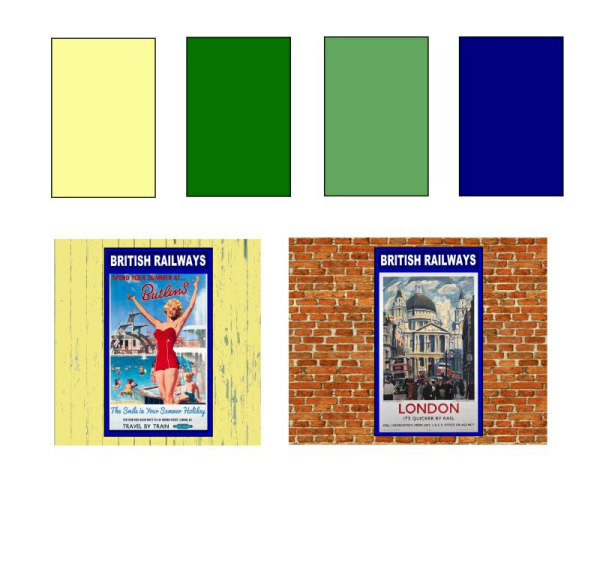 The LNER green/cream colours were only introduced in 1937, and between then and 1948 almost all buildings seem to have been repainted. Allow for the war, and most would have been painted in the 1945 - 1948 period. That being the case, when the BR colours were introduced in 1951 the ER Civil Engineer no doubt thought that there was no point repainting buildings on which the paintwork was only a few years old and had plenty of life left in it. That being said, no other region followed this course, and it would have applied just as much to the (ex LNER) NE region which repainted everything very quickly. 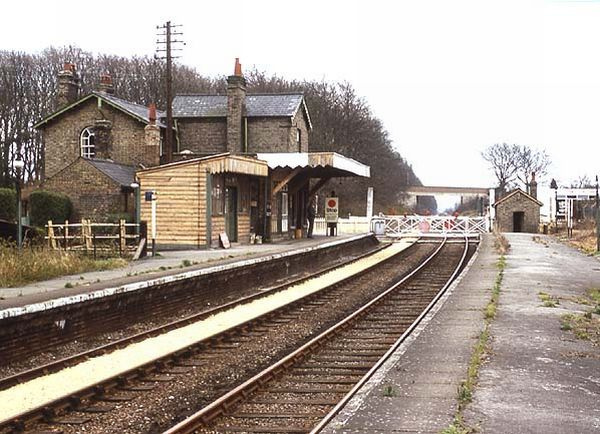 It did result in a lot of shabby looking stations by the 1960's. 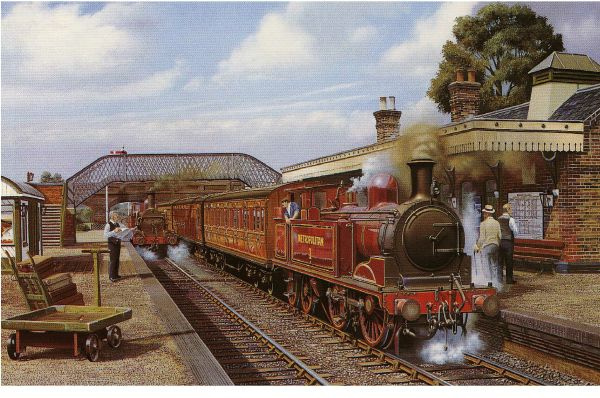 It has been sugegsted that stations were repainted during the BR period, but that exisiting stocks of LNER paint were used. It would be interesting to know more about this possibility. There is another thought - the regional blue was officially 'Oxford Blue'........ can you imagine anyone being brave enough to paint Cambridge station that colour?! 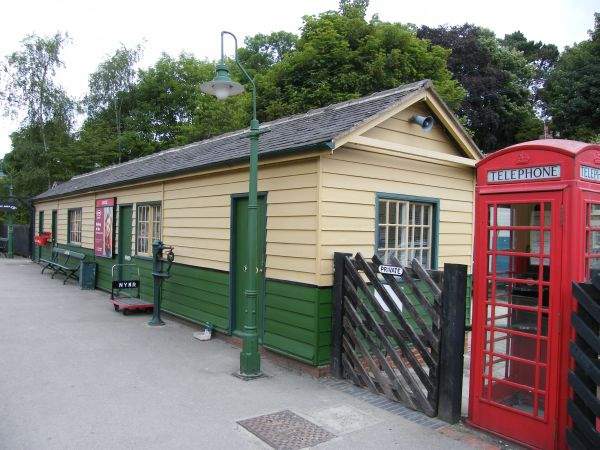 I have seen photos of signal boxes still in LNER green & cream at Histon in 1980 and at Sudbury in 1981, which surely must have been the last survivors in BR use. There is a suggestion that some signal boxes in the March area were painetd in cream & blue in BR days, but I have no confirmation of this other than mention of a piece of cine film showing the colours. Does anyone know any more? BS381C references seem to be shade 381 Biscuit for BR cream and 108 Aircraft Blue for the regional blue used on signs - follow the links on the 'Colours' page for BS colour patches. 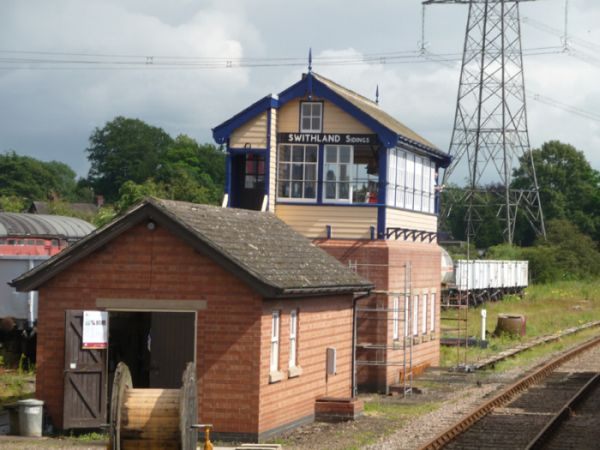 The GCR has painted Swithland signal box in the regional blue and cream - it looks nice but I've never seen a picture of a box in those colours in BR days. The North Eastern region was even stranger; the official regional colour of Tangerine only appeared on the signs and poster boards, while the buildings themselves were painted in a very attractive livery of light grey officially called Ivory and sky blue officially called Oriental Blue. Sky blue was the Scottish regional colour! The new colours began to be used in the mid 1950's, so there was a gap between the official colours being introduced in 1951 and the ivory/blue livery appearing. I wonder if the Civil Engineer spent the period in between arguing his case? After all, Tangerine & Cream would have looked a bit like a trifle! 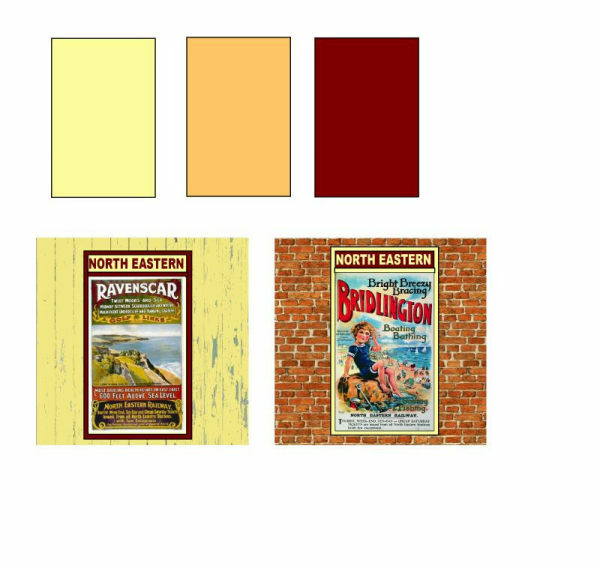 Whatever the reason, the NE region ended up with a very attractive colour scheme which looked best on timber buildings, where the bottom three feet or so of the walls was blue, along with the doors, ironwork, etc, and the top part of the wall was in the ivory. 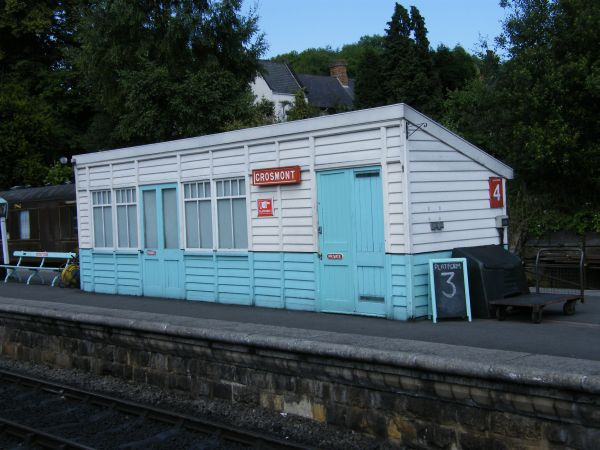 The Oriental Blue was used for lamp posts, signal box steps & the like, the only Tangerine seen being on station name boards & the enamel notices. These complemented the Ivory & Blue paintwork quite well, though wooden boards painted in Tangerine did tend to fade rather. The Tangerine seems to be BS381C 592 International Orange. PAINTS FOR MODELLERS: Tangerine - Tamiya flat orange. Ivory - Tamiya 'Ivory' acrylic. Oreintal Blue - no match at present; possibly Tamiya sky blue lightened with white. 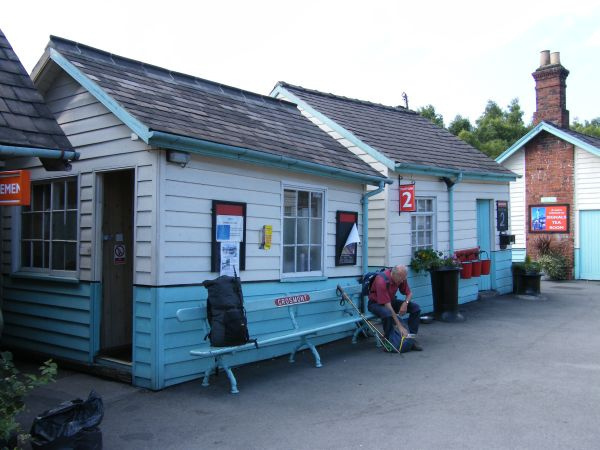 BEST PLACE TO SEE IT: The NE regional colours have been used at Grosmont station on the North Yorkshire Moors Railway.